Each year, we throw a joint party for our three kids since their birthdays are fairly close to each other. I like to create a memorable experience for them by giving them a themed party that they can all get into. This year’s party was a Pokemon party, which my boys are generally more into, but my daughter also likes Pokemon as well. 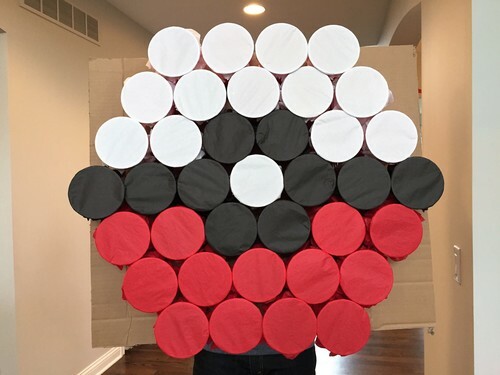 I got the idea for this Pokemon Punch Party game from Pinterest, but didn’t find great instructions on how to up it together. I'll show you how I put this game together in case you want to give it a try. 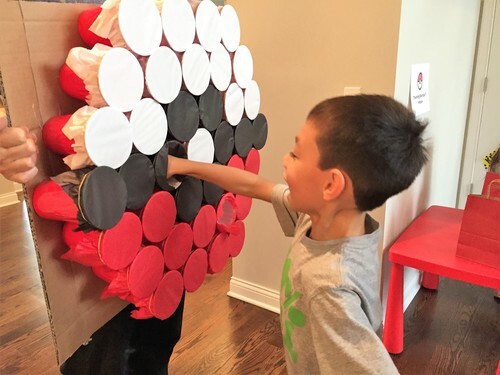 It could also be used for other themes – the sky is the limit with this punch game! Step 1. Arrange your red cups using the configuration below. Measure the length and width of the entire configuration so you know how large your cardboard piece should be. Step 2. Cut a piece of cardboard out according to the dimensions from Step 1. I just used a large box that was sitting in my recycling pile in the garage. Step 3. 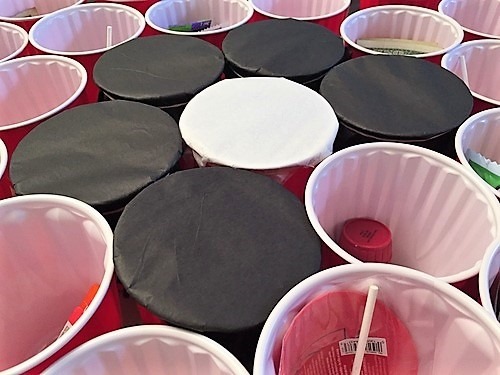 Keeping your Solo cups in the same configuration from Step 1, fill them with small toys and/or candy. I mainly used small toys that I bought from Party City. 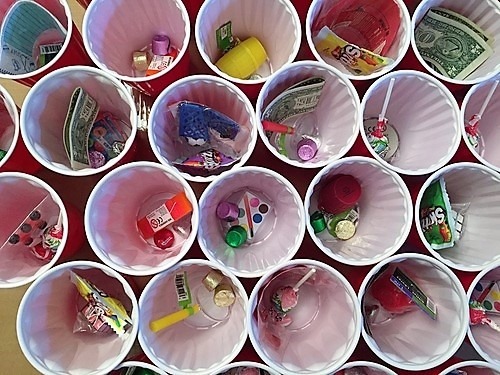 Some of the toys included small water color paint sets, whoopy cushions, small sports games, and candy. I also put six $1 bills in six of the cups, for an added element of surprise and excitement. I also put a Pikachu figure in a cup – whoever found this Pikachu got an extra punch at the end of the game. Step 4. Take a square piece of tissue paper and cover the top of a Solo cup. Put a rubber band over the tissue paper to hold the tissue paper on top of the cup. Once you’ve attached tissue paper to all of the cups, you’re ready to attach the cups to the cardboard piece. Make sure you keep your cups in the same configuration from Step 1 so you know what order to glue the cups in. Step 5. 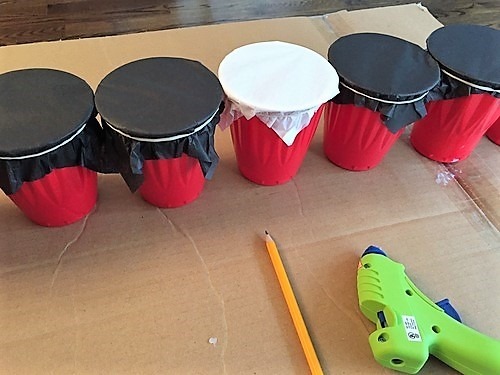 Use a hot glue gun to attach the red Solo cups to the cardboard piece. I covered the bottom of each Solo cup with hot glue and then pasted it to the cardboard. 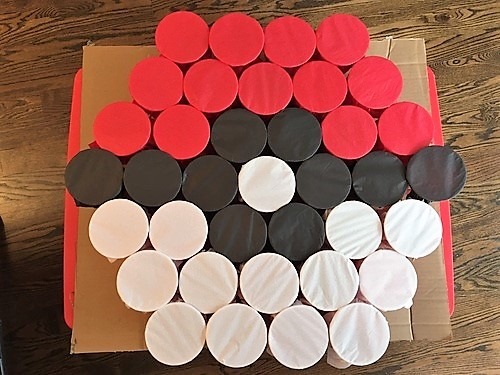 On the day of the Pokemon party, we just had someone hold up the cardboard so the kids could take turn punching into a cup to find their surprise. We had one extra cup left over, so we gave the extra punch to the child who previously found the Pikachu in the cups. That's it! This Pokemon Punch party game did take some time together, but the kids adored it and it was pretty inexpensive to put together!